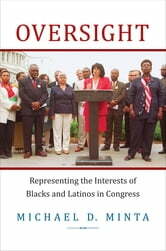 Oversight answers the question of whether black and Latino legislators better represent minority interests in Congress than white legislators, and it is the first book on the subject to focus on congressional oversight rather than roll-call voting. In this important book, Michael Minta demonstrates that minority lawmakers provide qualitatively better representation of black and Latino interests than their white counterparts. They are more likely to intervene in decision making by federal agencies by testifying in support of minority interests at congressional oversight hearings. Minority legislators write more letters urging agency officials to enforce civil rights policies, and spend significant time and effort advocating for solutions to problems that affect all racial and ethnic groups, such as poverty, inadequate health care, fair housing, and community development. In Oversight, Minta argues that minority members of Congress act on behalf of broad minority interests--inside and outside their districts--because of a shared bond of experience and a sense of linked fate. He shows how the presence of black and Latino legislators in the committee room increases the chances that minority perspectives and concerns will be addressed in committee deliberations, and also how minority lawmakers are effective at countering negative stereotypes about minorities in policy debates on issues like affirmative action and affordable housing. The Impending Impeachment of Donald J.Trump: What is Truth?